Since I have the luxury of having this recipe in both a complicated two page directions description... and the old time 4 sentence layout you are going to get my cake between the two and what I actually did. I left a few things out. Raisins for one. One of the two recipes also called for a grated apple and I just couldn't bring myself to do that for two reasons. 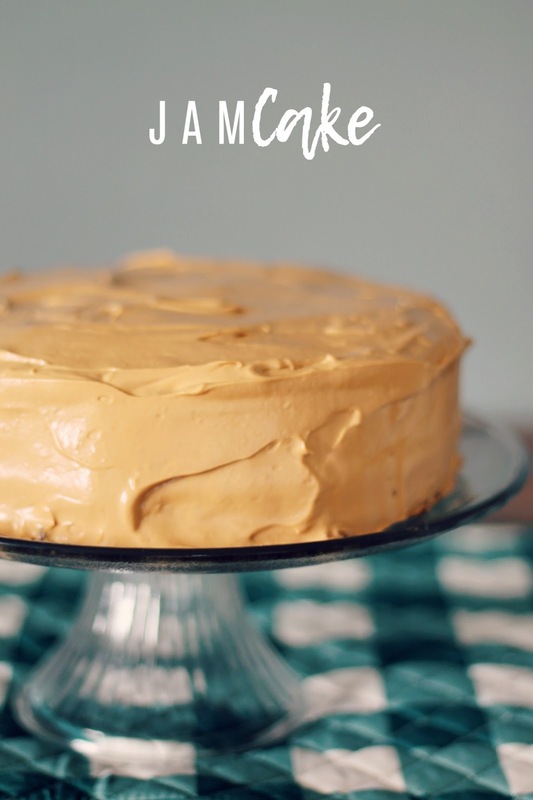 1) I don't like a ton of extra texture in my cake. 2) I was being lazy. Who on earth wants to grate an apple? This my friends is not the prettiest cake you've ever seen, but it tastes really good and has a mix of flavors I haven't had in a cake before. For instance the Acadian recipe called for a mix up spices that was updated to be easier to obtain in the Southern Living version by just using Pumpkin Pie Spice. It seems like an odd thing to add in my opinion, but it give the cake a nice deep winter feel. 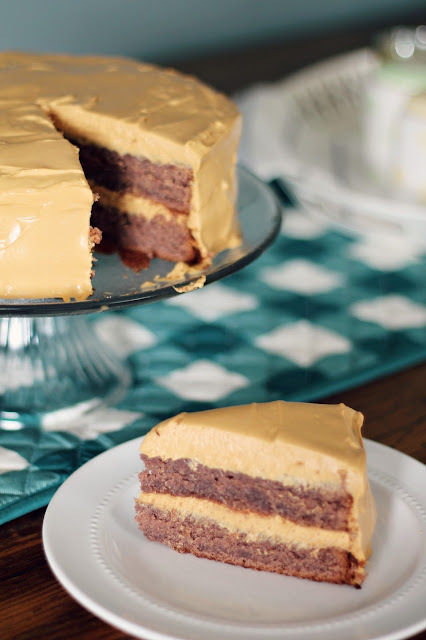 The way this particular cake came about was way back in the day when sugar wasn't so easy to come by this was made with whatever jam people had stored in their pantry. I used blackberry, but I even saw somewhere that strawberry fig jam was used. 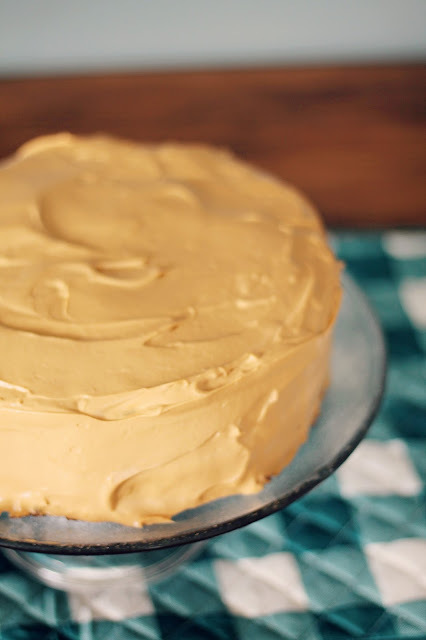 In the case of other jams I don't know if I'd go the caramel cream cheese icing route, I would probably just make a basic cream cheese icing. However, older recipes call for a burnt sugar icing. Preheat oven to 350. Cream butter and sugar well. Add in eggs in one at a time until light and fluffy. Slowly add flour, cocoa powder and pumpkin pie spice, alternating with buttermilk (with baking soda dissolved in it). After everything is mixed in add the jam, vanilla, and lemon juice. Spoon into 4 greased and floured cake pans or 2 pans with batter leftover for cupcakes (that's what I did, I don't have a large cake dome). Bake cakes at 350 for 35 minutes, or as my ancient cookbook says... until done. Poke the cake with a wooden skewer in the middle, it should come out clean. Beat cream cheese and butter at a medium speed until creamy. Add dulce de leche 1 can at a time, beating until blended after each. Gradually add 2 tbsp of whipping cream, 1 tbsp at a time, beating at a medium speed. Add up to 2 more additional tbsp until frosting is at the desired spreading consistency. 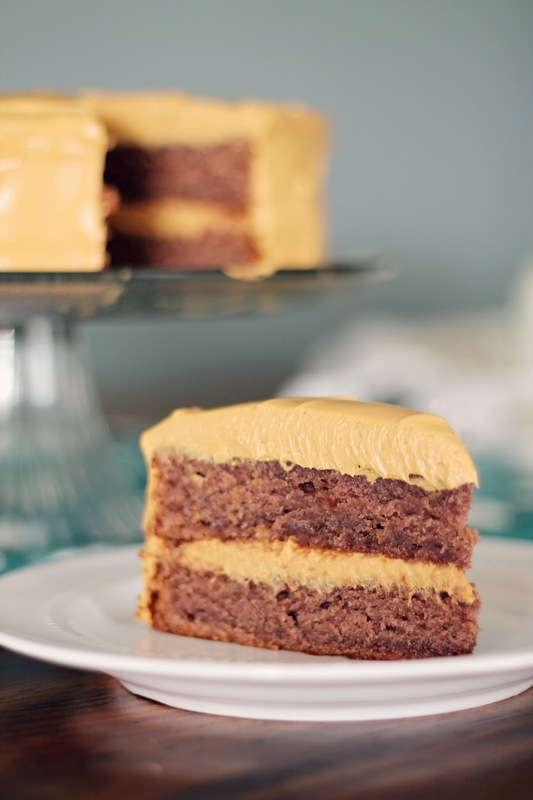 Spread frosting between cake layers and on top and sides of cake. The batter actually had a bit of a purple hue before being baked that I had hoped would hang around. Instead it has more of a chocolate color with a purple tinge. Either way it's super yummy and incredibly dense and moist from the jam. I tried to take it with me to bible study the other night and Jeremy wouldn't allow it to leave the house, if that says anything about how he likes it.